We've uncovered a recently declassified GDI criminal dossier on The Brotherhood of Nod's enigmatic leader, Kane. 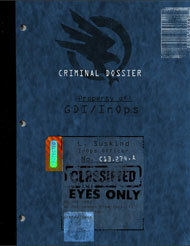 Compiled by former GDI InOps officer Lia Suskind, who ultimately defected to Nod at the onset of the 2nd Tiberium War, this dossier is the product of years of research on the myriad of myths surrounding Kane. Parts of this dossier had been withheld or blacked out by GDI intelligence, and now we're making it available to you for the first time. C&C Community manager Apoc sits down with lead designer Jason Bender and lead balance designer Greg Black in this riveting 40 minute interview discussing some of the hottest topics in the game!